The “Two Worlds, One Destiny” saga ends here! Metamorpho and an army from the planet Dae Won battle Kanjar Ro and his heinous space pirates for control of the Orb of Ra. 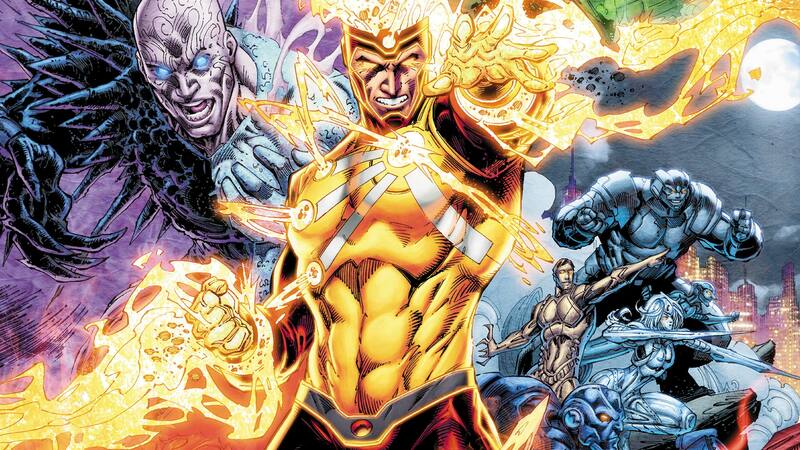 If Metamorpho and his faction don’t succeed, Kanjar Ro will use the Orb and take the universe for his own! Firestorm and Multiplex must go head to head to seize the future of our world as the Quantum Field generator is still unpredictable and begins causing mutated machinery and insects to overrun our reality! Sugar & Spike have a unique clientele made up of today’s A-list superheroes with embarrassing secrets in need of covering up. But our dysfunctional duo’s world is about to get even stranger when a team of time-traveling heroes from the 31st century tasks them with an urgent case that promises to alter history itself. Behold the culmination of Keith Giffen’s entire professional career (thus far)…Sugar & Spike and the Legion of Super-Heroes! Chemo strikes! The walking nuclear waste dump attacks New York City, and it’s up to the Metal Men to put a stop to it—but who’s been lurking in the shadows since the ‑beginning?